Here is the first of my haul from the wonderful Ian Drummond Studio Sale. Initially when I saw this dress I scanned right past it mostly due to the straight shape which normally isn’t the best for my body type. As is often the case though, when someone else took it in their hands and was admiring it I decided that even if it might not be perfect for me it would be fabulous on someone and ideal for my shop. I hovered around the rack trying to look as nonchalant as possible while patiently waiting for the other person to place it back. The dress had barely touched the rail when, like a serpent ravenous for its prey, I snatched it up lightening fast. These are impressive skills I’ve honed from years of professional thrifting. Do not try this if you aren’t trained to back it up with some perfected thrift store fighting moves. I can walk right by something sometimes but if someone else is taken with the piece I have to go back and figure what I missed the first time I saw it. Sometimes it is only the threat of someone else walking out with the item that is enough to make me want to pull my wallet out. I think this has more to do with vintage because each piece is one-of-a-kind. If you like something you need to react quickly with no hesitation or regret. Vintage and thrift shopping teaches you valuable decision making skills. Just another benefit of shopping secondhand. Needless to say, when I tried this dress on I fell head over heels in love. The textural daisy lace overlay is a beautiful and unusual detail. These types of unique details make my vintage loving heart beat faster. The neck bow is so Peggy from Mad Men. I picked up these daisy earrings when I was in BC in Langley visiting my parents at the fantastic Fort Langley Vintage Antiques Mall. It is one of my favourite spots to spend an afternoon with my Mom browsing through the massive maze of vintage and antique curiosities. Funny how my earrings pair perfectly with the dress! Kismet! Across the street from the vintage market in Fort Langley is one of my best-loved places in BC to eat… The Blacksmith Bakery. The owner studied baking in France and their pastries taste every bit as good as what I ate when I lived in Montpellier in the south of France. The rest of the food on the menu is fantastic too, I highly recommend it. What do you think of the dress? Would you keep it? Are you sometimes influenced by other shoppers? Drooooool…. I would totally keep that dress, Suzanne! I love how you’ve styled it with the earrings and THOSE SHOES! Girl, you have the best shoes! But back to the dress—Yes! It is so so lovely with the layer of lace over yellow. And it looks amazing on you. ::sigh:: That’s a happy sigh. I love seeing what you find. I knew you’d love this dress Sherry. It has a bit of a Sherry vibe really. That dress looks lovely on you, those fabulous red sandals are brilliant with it, a much better option than something super sweet and matchy-matchy. I’ve noticed that if someone picks out an item from our rails and then puts it back another person will pounce and buy it often only for the original browser to come back and ask where it is. I’m tempted to pay one of my friends to hold stuff up and try things on just to ramp up the sales. That is hilarious you have your fans following you around. I had one woman pick up a piece I’d discarded after some thought. She met me at the cash and said she picked up that piece because it looked like I knew what I was doing. She said, “Oh I took one look at you and knew.” That’s a ummm…compliment? I think? Anyhow, she is also a vintage reseller so I guess it takes one to know one. She deals with a business partner that provides all of their clothing for free and they resell for them. I’m assuming she works with a charity and gives them a percentage of her sales. Anyhow she pointed out some great pieces she had spotted but wasn’t willing to drop $17 for a maxi dress which I can totally understand when you’re used to getting it all for free. I *love* this dress. Really adore it. The cut, the color, the vibe… it all works. On you, it’s perfection. I absolutely LOVE the dress! But it’s sadly not a shape that works for me. Looks good on you though! It is funny because I really thought this wouldn’t work on me either. I was pleasantly surprised. I can’t think of a floral image that was more iconic in the 60’s and 70’s than the daisy. It came to symbolize peace, love, and happiness particularly in fashion. I’m not at all surprised that you have vintage earrings that match it perfectly either. 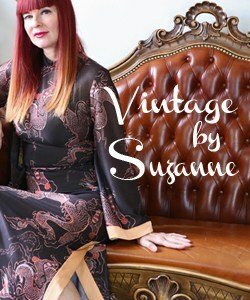 You look really fabulous in this dress Suzanne. KEEP IT!!!! I was delighted to stumble on those earrings when shopping with my Mom. I can only wear clip ons now so they are perfect. I need to get the courage up to punch back through the hole in one of my lobes. So far with my fibromyalgia I haven’t tried. Do I do that? Sometimes, yes. If they put it back, I’ll at least go have a second look. Usually I still don’t want it but I have to be sure. Heh. I’m glad you got this baby back. It’s a claaaassic. And the earrings, you couldn’t match any better. Great finds. PS. Our grey bridesmaid dress from the meetup wedding is featured on the Fashion Mia sidebar link right now. Hahaha!! I know! that same dress comes up in the side bar all the time for me. Too funny! that dress looks fabulous on you! how cool that you got matching earrings already! back in berlin i had to watch other 2.hand shoppers…. but here in the woods are the only one with the strange taste……. Of course…it seems like if someone wants or likes something…it just makes it better!! As a lover of the color yellow—I’m in love with this dress. And adding in the red shoes just makes it absolutely perfect, Suzanne!! Yes, we are easily influenced by those around us…especially other bloggers. 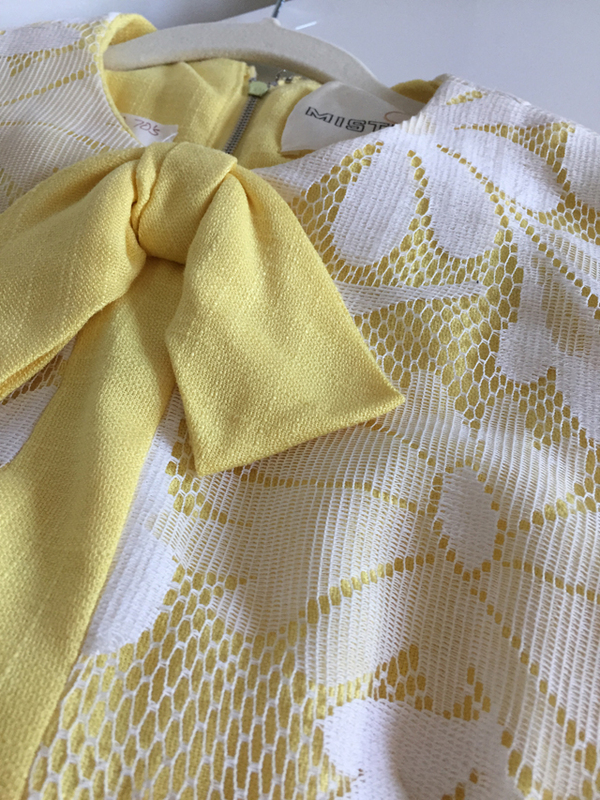 Love this sweet yellow sheath dress with the lacey daises and perfect yellow bow. An excellent haul at the vintage market. I agree that this dress is limited to certain body types but it is a stunning piece. As far as shopping goes I am quite decisive. I find something and I don’t hesitate— At thrift stores anyway. .. fortunately NOT at high end stores. Ha! Yes, we are all able to exercise some self control when the price tag is super high. It is an excellent deterrent to over consumption. That is such a pretty dress, and I love that style on other people, just not me – I’m too “boxy”. It sounds like you scored some great stuff at Ian’s sale so I’m looking forward to seeing more. When I’m thrift shopping, generally the stuff I go for is not the things other people get excited about so I’m not influenced by what other people pick up. I have found that in my friend’s store when I get excited by a piece that I’m thinking of getting, within a day or two someone else will have come into the store and bought it. I have to say that sale was even better than going to one of the regular vintage clothing shoes. I was very pleasantly surprised. mwhaha, I’m always amazed when somebody looks interested in whatever I’m looking at a charity shop, and sometimes I’ve even point out a piece to another possible buyer!. But the charity shops I’m used to visit have ‘good vibes’. 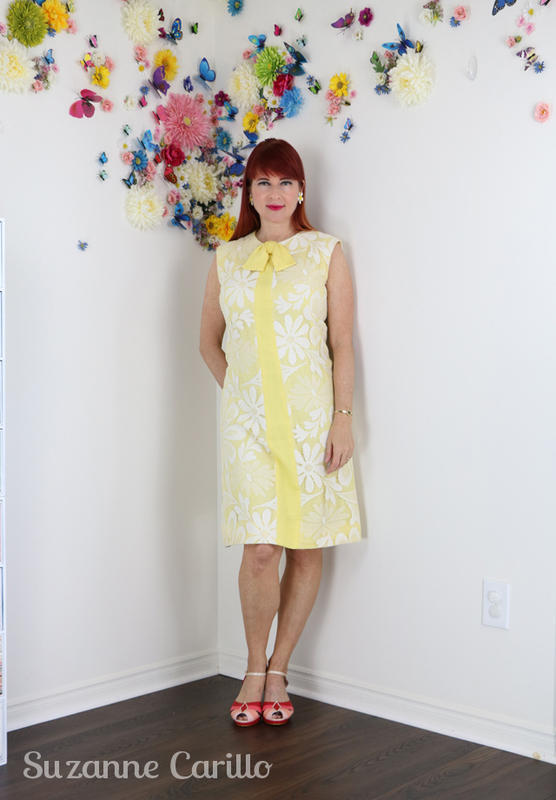 I Love this cute yellow dress on you, (and the matching earrings!! so cute!) 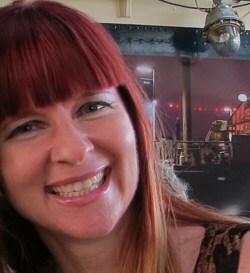 you look absolutely gorgeous, and made me think on ‘Down with love’ film, so fabulous! I totally forgot about that movie. I need to see if they have it on Netflix. I love it! What an adorable dress! Too bad lace doesn’t do well in my home. Two cats and two tall dogs = one big snag. I’m paranoid when my pug comes around. Good thing she is too short to do any damage. See, you have thrifting Superpowers! Able to swoop in and get the garment at record speed! 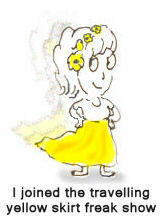 It does look wonderful on you, I love yellow and the daisy print is so fun and pretty on you. I thrift shop on-line on Poshmark and sometimes Ebay, so I don’t get influeced by shoppers often. This was at a vintage costume and movie sale…even more competition! The dress is indeed lovely and the earrings with it, a great find. But to tell you the truth (may I? ), I have seen you in better stuff. I think it has to do with the high neckline. Just my opinion darling. You decide. Not me. You’re the only one that doesn’t care for it. It is true I don’t often wear high necklines. They shorten my body. In this case though I’m willing to give it a pass.